A middle-income country, Jordan's population has increased rapidly due to the influx of refugees from neighbouring crisis-affected countries, particularly Iraq and Syria. Active in the country since 1976, UNFPA currently supports the government on issues related to maternal and newborn health, reproductive health, gender equality, and population dynamics. 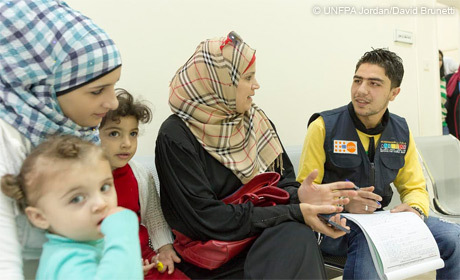 It has also been on the frontlines of the response to the Syrian crisis, providing reproductive health support and life-saving services to Syrian women, girls, and youth in Jordan.